I was planning to go and select fabric, chop, press & sew tonight, but it didn't quite work out that way. Seeing as I'm still at my computer, and it's now closer to midnight than any other hour it's not going to happen. Ah well, it would have been freezing in my sewing room anyway. Actually, it's not so warm down here with the heater on either! Anyways, I've done a bit of phot0-processing, so I can at least share one of the wristlet/clutches I've made in the last couple of weeks. This is a all a learning process as I work out what I like and what I don't. 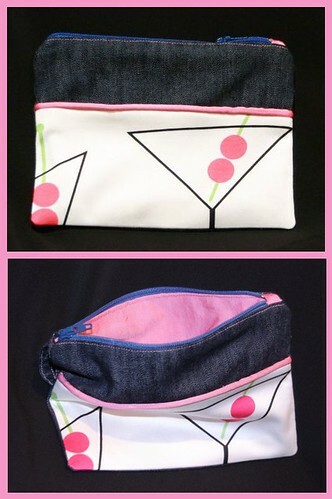 I love this martini fabric, and I love how it looks with denim. I don't however like the way I've finished the zip, but have worked that out for next time now.